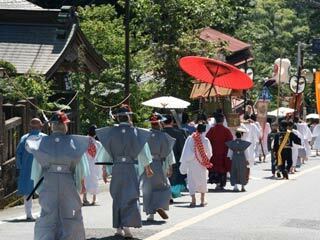 The Oyama Afuri jinja matsuri(大山阿夫利神社祭) is a unique festival held on mount Oyama in the Tanzawa mountains in Kanagawa. Mount Oyama is 1,252 metres high and has long been regarded as a holy mountain and object of worship. A sacred Shinto mikoshi is carried from the Afuri jinja, which is located on the top of Mount Oyama, first to the lower shrine on the side of the mountain, and then on down to the shrine office at the very foot of the mountain; a distance of 8km. 0. at Kozu Odawara Station. 2. use bus to Oyama Cable. The Oyama Afuri jinja matsuri is a unique festival held on mount Oyama in the Tanzawa mountains in Kanagawa. Mount Oyama is 1,252 metres high and has long been regarded as a holy mountain and object of worship. A sacred Shinto mikoshi is carried from the Afuri jinja, which is located on the top of Mount Oyama, first to the lower shrine on the side of the mountain, and then on down to the shrine office at the very foot of the mountain; a distance of 8km.